More of the same. I like where I am right now. The notion of growing up is a funny concept, as it conjures a certain set of hurdles one must pass to be grown up. Short answer: me. Chamomile tea with honey and hazelnut milk. I have had probably around 30 or so such jobs since I started working at 15. I would prefer to have a thinking job from this point in my life forward, otherwise what was the point of a graduate degree. No. I believe in critical thinking, a healthy skepticism, and an open mind. Call me old-fashioned. 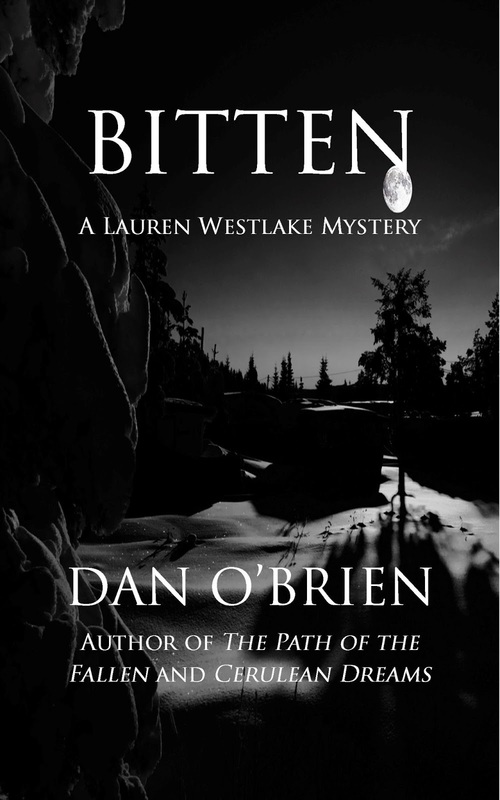 Lauren Westlake had not yet seen the monster that hunted the woods of Locke. Nor was she privy to some of the uncouth and less than reputable members of the community. But as she pushed open the doors of the Mill Saloon, she was aware of one thing: something was wrong in Locke. She pulled off her hat and tucked it into her bag, flushing out her hair. The bar was as one expected, dark and smoky. There were few lights and even fewer women. Booths lined the outer walls except for the one that housed a wooden bar adorned with various hides, pelts, and horns fitted to inexpressive plaques of death. As she walked through the open area that served as both a dance floor and a drunken staggering area, many heads turned to watch her pass. Lauren was indeed an attractive woman; as well as confident, with a sense of purpose and an intensity that might be viewed as unusual in such a small town. Sitting down on a stool with a smile, she placed her hands on the counter of the bar. The bartender was a thick man in shoulder and girth with a heavy beard of coal hair. His shirt was too loose and his pants too tight. The thick slur of his voice hinted that the good bartender was sampling his own goods. Lauren looked around the bar; most people had returned to their business. But some continued to stare. A particular one, dressed in a manner that attracted the attention of the drunken, masculine sort. She watched the woman cross the room, drawing stares from every man; the cut of the shorts alone would have facilitated that. Dark red lips and piercing hazel eyes fixed on Lauren immediately. The woman crossed her arms underneath her breasts and cocked her hips suggestively. The woman looked at her in shock. Lauren was quite certain that another woman had never talked to her that way. Lauren reached back and grasped the dirty-looking glass and took a sip, wincing as she did so. She had overestimated her once rather stout resistance to the brown stuff. There was a moment where Lauren thought the woman might respond to her challenge, but it passed as the hard stare went glossy. It was the early stages of sorrow and tears, mostly from embarrassment and as well the deep throes of anger. The woman bit her lip as if to say more and then turned, flashing nearly the entirety of her womanhood at Lauren before fading back into the throng of staring drunks once more. As if on cue the bartender leaned forward, pushing another glass of dark amber liquid. She thought about saying something back to the bartender, perhaps dissuade this newfound tough-gal personality, but thought better of it. It might serve her well to be perceived immediately as a kind of hardass. People would certainly be less inclined to question her motives if she did not allow a lot of room for discussion. His voice had a rough, deep quality to it, but there was as well something profoundly articulate in his speech. Turning, she looked into his cool blue eyes, vast oceans of serenity that stared back into hers with a distant glint. A light beard covered his face, like he had been hiding from a razor for several days. His lips were a kind of small, perfect curvature that made her heart flutter in a way she would never admit to another person. He wore a long sleeve shirt under a black button-up, a swooping, gold design across the chest. As he opened his mouth to speak again, he extended a hand, exposing heavily muscled forearms that rippled as he reached out. “Dominic,” he spoke with clear inflection. Lauren stared at him for a moment, uncertain of what to do next. It was one of those moments when it felt like the world had plunged into slow motion. Each utterance, every smell amplified beyond its normal dominion. Dominic stared for a moment, seeming very at ease leaving his hand out there waiting for her. With a sheepish smile, she extended her hand as well. He had a strong grip, but not one that was intimidating or a turn-off. He smiled and it was a dazzling one. Once again, she felt her heart flutter. Why was she acting like such a girl? Perhaps it was the whiskey. She shook her head. Realizing that he was watching her carefully, she blushed. There was something distinctly odd about the way he asked the question. As if he were transplanted from another time period, pulled from an era of courtesy. Lauren looked at him strangely, uncertain if she should give credence to the warning in her stomach. The concern she felt immediately that a random man was taking interest in what she had to say. “Dominic McManus,” she spoke softly. Lauren looked at him, completely flummoxed. Lauren was beat red now. She inched closer still, his smell delicious. Perhaps it was the long train ride or the time that had passed since she had slept with a man. Or perhaps it was simply because he was gorgeous. The look that rose to Dominic’s face was one of quiet disbelief mixed with concern “Werewolf?” he repeated briskly. Lauren looked through the haze of whiskey and realized her error. He was not wrong. Speaking to some random person about events that were not meant to be public knowledge was more than taboo, it was grounds for dismissal. She felt like she would cry. Or at the very least scream quite loudly. The words sounded silly as she spoke them. She was overcompensating for the dwindling pool of thoughts she had to draw from. Dominic smiled again. His face came alive each time as if his joy were an aphrodisiac. She nodded. Feeling the whiskey take over completely, it broke down the walls of her implicit rules; the fortress behind which she dwelled so efficiently. “There might be some things here worth my time,” she slurred slightly. It was no secret that her skill at flirtation was less than par. Dominic looked at her, the intensity of his blue eyes speaking of a much older being than the one who sat across from her. She shook her head, the mist of intoxication making her think strangely. This book gives me goosebumps! I’d love to read the whole thing.